Never underestimate the power of a title. Some are real turn offs and others lure you in. Back in Santa Fe I was intrigued by the title above given to the current exhibition at the New Mexico Museum of Art. Boots are, of course, utilitarian apparel, but the cowboy boot is interwoven in the fabric of North American history, representing the life and lure of the Old West. Even abroad if you are wearing Western boots someone will say, ‘cowboy’. Who would have thought you can take the subject of boots and amplify it into an educational, humorous and even exciting exhibition. Sole Mates uses history, anthropology and art with a sense of humor, to trace the origin of the form from the generic riding boot of the 1880s, and bring it up to the present. I was surprised how much one could learn from it. Most of us have seen images of the cowboy in the saddle roping or riding a bull wearing his boots but have you ever thought of them as a personal fashion statement or wearable art. The art part is usually hidden by trousers covering the tooled, sewn, cut and applied decorative design. Governor, Bill Richardson, who had done so much for the arts in the state of New Mexico is pictured with his fancy boots. On the actual boots which are displayed as well you can see his initials on the heels. 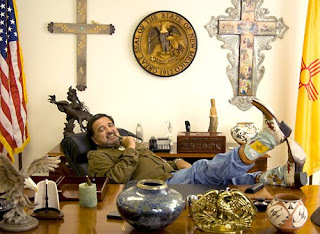 The photograph shows him in his art-laden office surrounded by loans selected by him and his wife from various museums in the state, but the boots are his own. Elizabeth Wells Smith took the photo of the governor and she wears boots all the time. In the exhibition we see her boots with one pair of Billy Martin boots all chewed up by her 190 lb. Irish Wolfhound… guess he likes boots too! The craft of the boot maker has hardly changed. It was thought of as exclusively a man’s profession but today that no longer holds true. An outstanding example is a woman who pestered her father until he taught her the trade. Her grandfather C.C. McGuffin left Texas and established his boot shop in Roswell, New Mexico in 1915. In turn he taught his son, L.W. the trade. L.W., however, did not think it appropriate for his daughter until she insisted. Today the talented Deana McGuffin is recognized as a leader in the field. The pair of boots she lent to the show are titled, “My Day of the Dead Boots”. 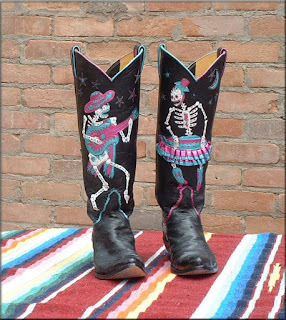 One boot shows a male skeleton playing a guitar and the other a female skeleton dancing in a skirt. These are both beautiful and humorous. She wears them outside her trousers otherwise no one would know! People can relate to this exhibition on basis of personal experience. 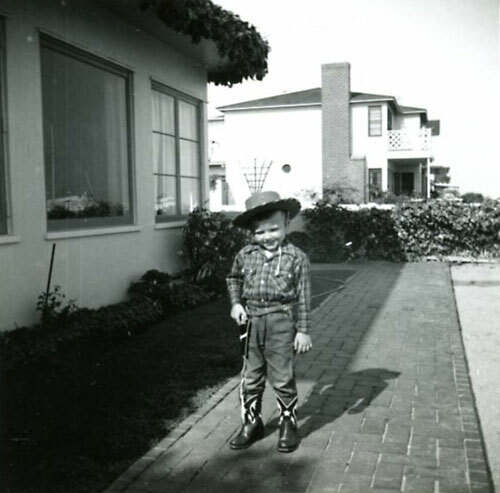 Every visitor I saw stopped at the Brownie snapshots taken in 1952 of a little dude, no more than 5 or 6 years old, posing in his cowboy outfit with his six-gun and holster. I know I can find a photograph of myself, the son of German Jewish refugees living in New York City, wearing the same garb. Paintings in the exhibition , including works by Remington and Russel and more recent Western masters, give life and historic context to the boots exhibited. Prints by contemporary photographers bring us up to date with images like several pairs of booted legs hanging out of the back of an old truck, and a woman in short shorts sitting on her motorcycle showing off her leg… I mean boot. One brings something to an exhibition and one takes something more away. I appreciated cowboy boots before I saw Sole Mates but I left with a much better understanding... and a smile on my face.